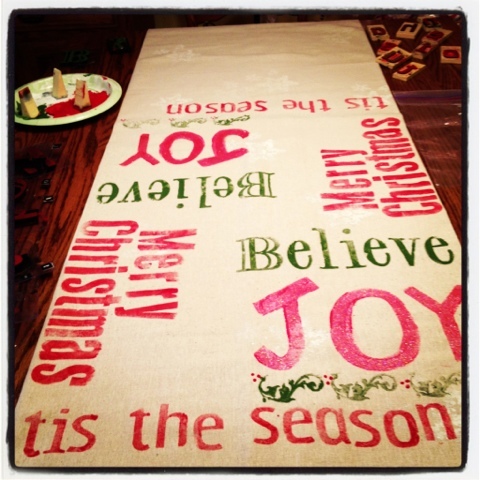 I got out my foam stamps and made another subway art table runner.. 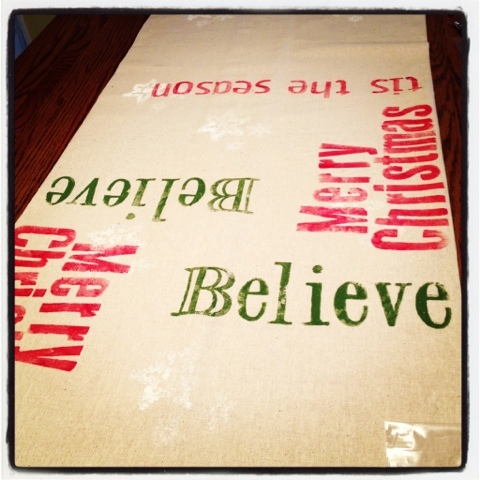 Using Christmas words and red and green paint.. with a little white and silver too.. I used osnaburg again for the base and for the ruffle two different sizes of red gingham. I stamped some snowflakes lighty with white and silver paint , its hard to see them in the photos. I used a mixture of fabric paint and regular acrylic.. The fabric paint has glitter so its got a lot of sparkle to it. I finally got the ruffles sewn on this morning.. at least one project is finished ! Hoping to get my front porch decorated today since it will be a little warmer ! Thanks for visiting ! As always thank you for your wonderful comments ! I hope you all have a fabulous Thanksgiving with your family and friends ! Good morning friend! 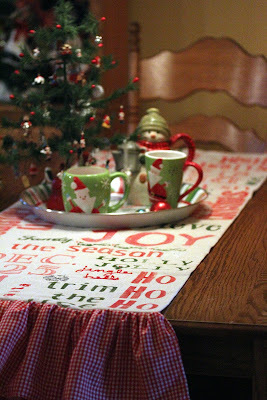 I love, love, love the table runner! Loved your fall one too. I have some osnaburg, and guess what, I just may dig in to see how much I have for a runner myself. But you know what makes this runner the best? Your buffalo check, and gingham ruffle on the ends! Swoon!!! That is fantastic! I love this so much! You did an awesome job. Just love it because it is so cheerful. Thanks for the great idea! It looks very pretty. I love the red gingham. Very clever! I like the gingham ruffle. This would be a great idea for any holiday. This is really gorgeous!!!! I also love the tray of christmas mugs on the table ~ I think I may go buy myself some festive mugs today!!! Happy thanksgiving. It looks so cheery and fun, Priscilla--love the gingham edging! Oh...I just love your Christmasy table runner! It is so bright and cheery. What fun you must have had creating it. Blessings and a Happy Thanksgiving. 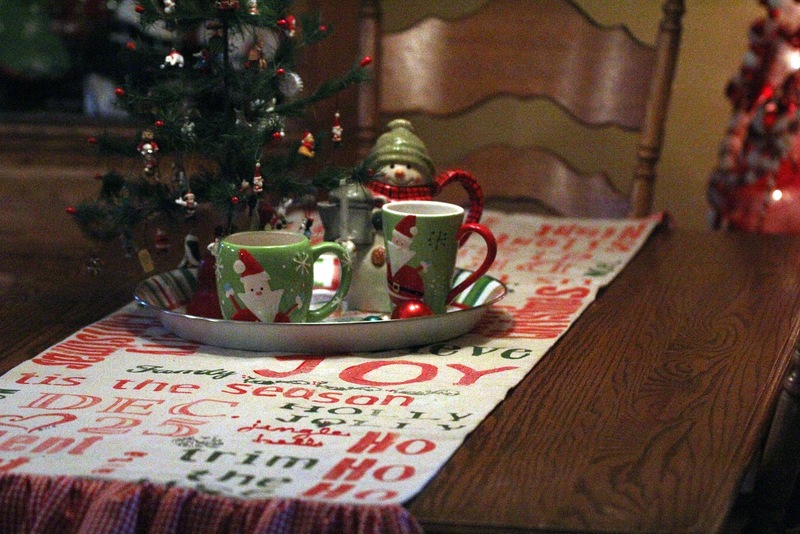 Your table runner is adorable. How smart of you to use the stamps! Thanks so much for popping in to see me and have a happy Thanksgiving. Oh, love the double ruffle. Gives it such charm. Those foam stamps are not that easy to use. I think you did a fabulous job! Thanks for sharing with Share Your Cup. That is such a cute idea! I use osnaburg for so many projects -- I just love its texture and look. 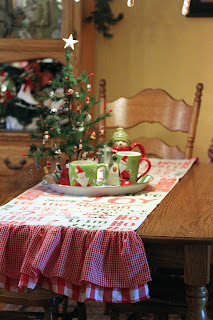 I really like the two sizes of checks on those table runner ruffles. The decorating has begun !